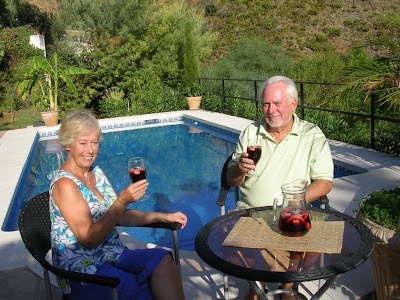 What do you drink lolling around the pool on a hot August afternoon? 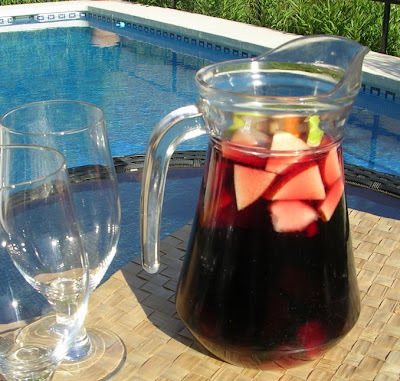 How about sangría, chilled red wine punch with fruit? Light and refreshing, sangría also goes well with party foods—ham and melon on picks, spicy meatballs, grilled mini-kebabs, fried chicken wings. There are variations on the sangría theme. Add different fruits, make it more or less sweet, fortify with brandy or a favorite liqueur, change the type of wine—red, white, rosé or cava. Should you dilute sangría with seltzer? For a lazy afternoon by the pool or an evening barbecue, you probably want to keep it light. What kind of wine to use for sangría? Choose young wines with no time on oak. Personally, I like the unaged tempranillo wines from La Mancha and Valdepeñas for mixing sangría. They are fresh and fruity at remarkably low cost. Here are some variations on the sangría theme. 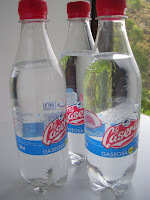 Red wine with fizzy gaseosa, a not-too-sweet citric soda, this is a summertime red wine cooler, a drink that’s served in bars all over Spain. It’s even served with tapas. Fill a tall glass with ice. Pour over red wine, top with gaseosa, a not-too-sweet citric soda, or any lemon soda. Add a slice of lemon. 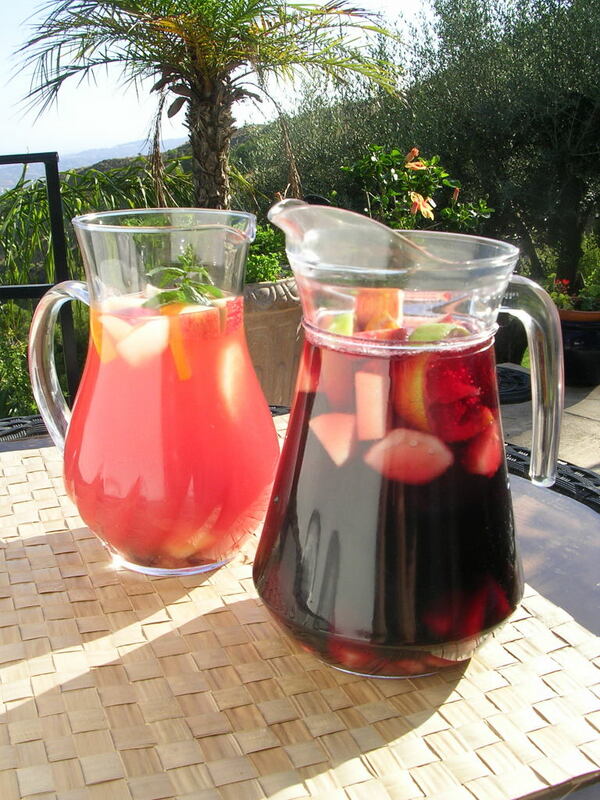 Sangría makes a great party drink and can be mixed in large quantities. Use any combination of fruit—strawberries, oranges, apples, pears and grapes are some of the best. (Apples float, oranges sink.) Dilute the sangría to taste with seltzer or soda water. Combine the sugar in a small saucepan with the zest and water. Bring to a boil and simmer 2 minutes. Allow the sugar syrup to cool. Strain it into a pitcher. Discard the orange zest. Add the fruit and brandy to the pitcher. The fruit can macerate, refrigerated, up to 2 hours. Add the chilled red wine. Immediately before serving, add chilled seltzer to taste. Serve the sangría and fruit in glasses or goblets. Prepare this colorful wine punch in advance and chill it. Or, if preferred, mix it and serve immediately over ice cubes. Place the sugar and zest in a saucepan with the water. Bring to a boil and stir to dissolve the sugar. Remove from the heat and cool. Discard the orange zest. Remove seeds and green rind from the watermelon. Puree the flesh in a blender or food processor. Sieve the puree and place in a pitcher with the sugar syrup, Cointreau or Triple Sec, and white wine. Chill the sangría. 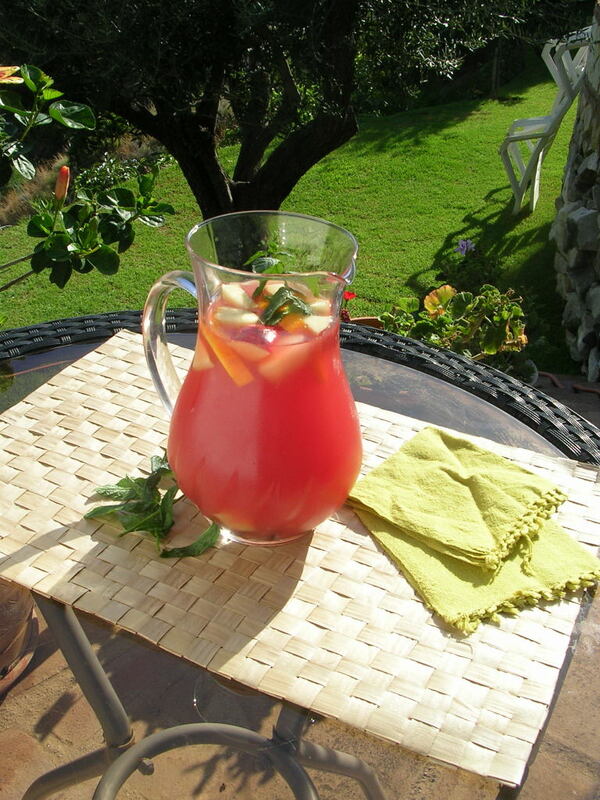 Serve the sangría, over ice if desired, garnished with strawberries, grapes, pear or other fruit and mint sprigs. 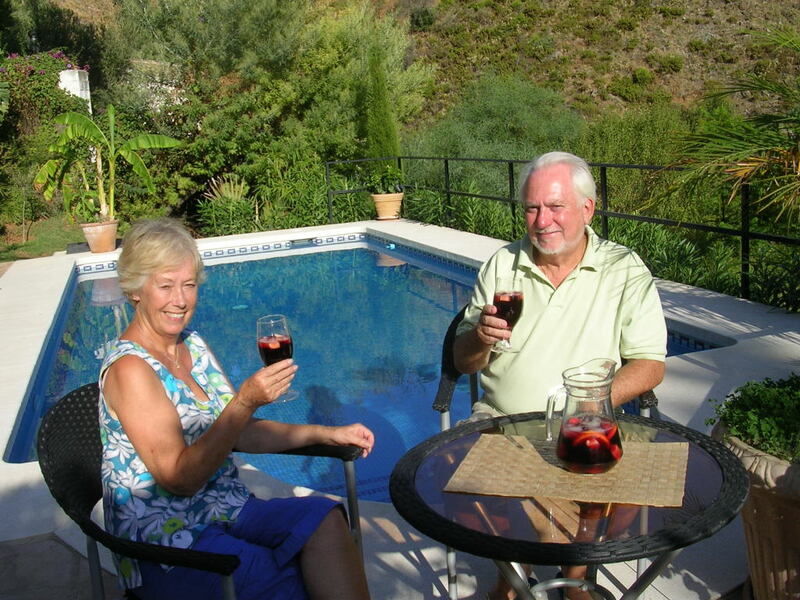 In La Mancha, this wine drink is mixed in big ceramic bowls and dipped into small cups to serve. Combine the sugar and water in a small saucepan. Bring to a boil and stir to dissolve sugar. Remove from heat and add the mint and half of the lemon and orange slices. Let steep at least 30 minutes. 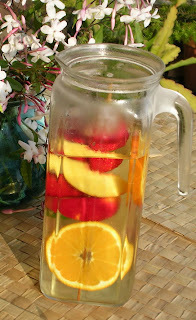 Strain into a pitcher or punch bowl and add the wine, remaining lemon and orange slices, and apple and peach. Dilute to taste with seltzer. Serve in tall glasses or cups, with ice, if desired. Garnish with mint sprigs. When I saw a ChefShop newsletter touting wild fennel pollen, 17 grams for $19.89, as a “well-kept seasoning secret” with “incredible flavor that stands on its own.” I said, “I gotta try some of that”. 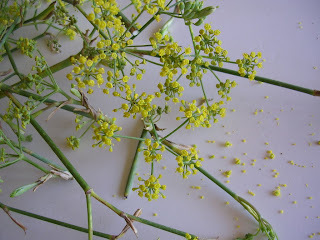 So I went to the edge of the garden, where the weeds range tall, and picked a bunch of flowering bracts of wild fennel. 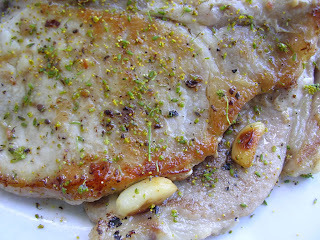 I pan-fried pork chops with slivers of garlic, put them on plates and, rubbing the fennel flowers between finger and thumb, I sprinkled pollen over the chops. So aromatic! A fresh, sweet fragrance, very nice with pork. Pork chops sprinkled with fennel pollen. My fennel pollen, bright yellow dust, is free for the taking, completely seasonal. I will pick some more flowers and allow them to dry in the sun, then shake out the pollen to save for later use. I bet it will be good with salmon. With cheese dip. With vegetables. Maybe sprinkled on pizza. Or, with prices like that, perhaps I should package and sell it. Wild fennel doesn’t produce a fleshy bulbous stem like cultivated Florence fennel. The bulb of cultivated fennel, which you can buy at the grocery store, is used raw or cooked. 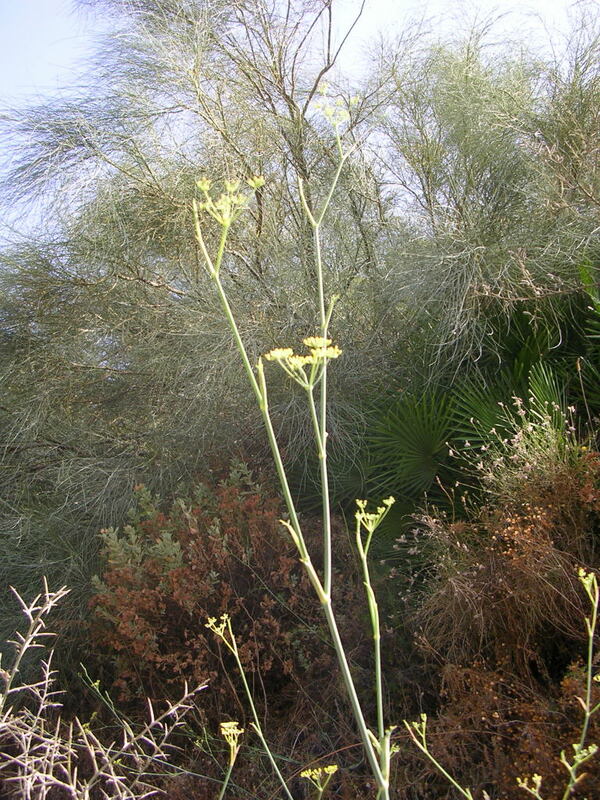 Wild fennel grows on dry slopes in Mediterranean lands and in California. A perennial, it sends up green fronds in the springtime. They grow to tall, rangy stems and, by the end of summer, bear yellow flowers, bracts of immature seeds. The seeds eventually turn brown and fall away and the plant dies back in the winter. 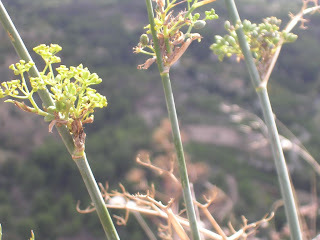 In Spain the first feathery shoots are foraged to be added to potaje, a stew with chickpeas, wheat berries and sausage. Snippets of the fronds are also sprinkled on spring vegetables such as fava beans, peas and artichokes. Once the stalks grow tall and fibrous, they are not fit to eat. But they make a wonderful addition to a grilling fire, producing an aromatic smoke that adds a subtle flavor to sea bass or bream. Fennel pollen, like yellow dust. 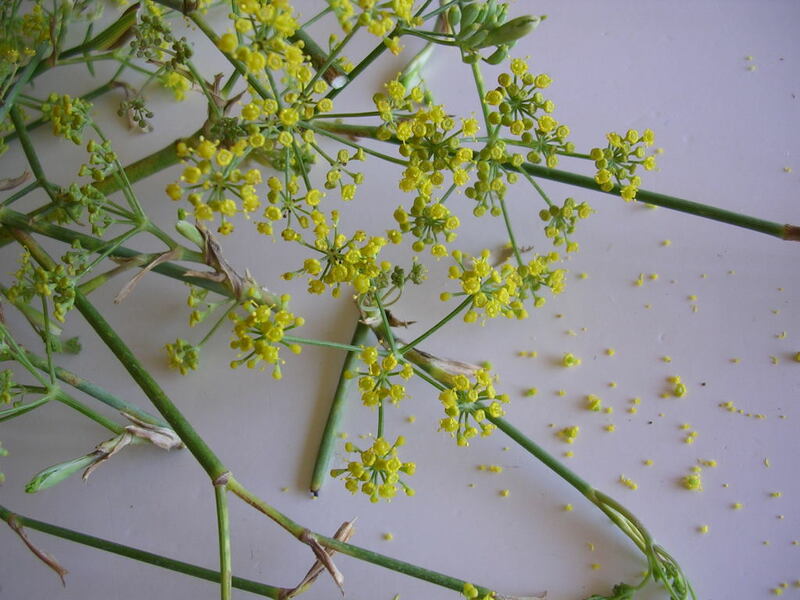 When the stalks make yellow flowers, it’s time to collect the pollen. Before I was turned on to fennel pollen, I collected the green seeds to use in cooking. 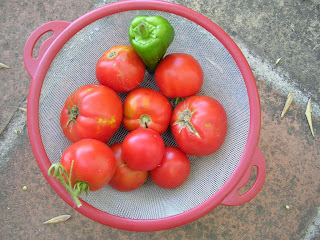 I especially like them in late-summer tomato sauce to serve with meatballs or pork. I sun-dry the seeds for use year-round. Come October, the flower heads of wild fennel are used as seasoning for home-cured olives. See that recipe here. Pan-fried pork chops with garlic and fennel pollen. Ripe tomatoes in the garden and hot August days—definitely time for gazpacho. At my house, gazpacho is true to its roots—tomatoes, garlic, onion, green peppers and cucumbers from the garden, a chunk of stale bread, my own extra virgin olive oil. I whirl the ingredients in a blender, sieve out the bits of skin and tomato seeds, thin the gazpacho slightly with cold water. Cool and refreshing, it’s a light lunch or an afternoon pick-me-up. Gazpacho belongs to Andalusia, southern Spain. 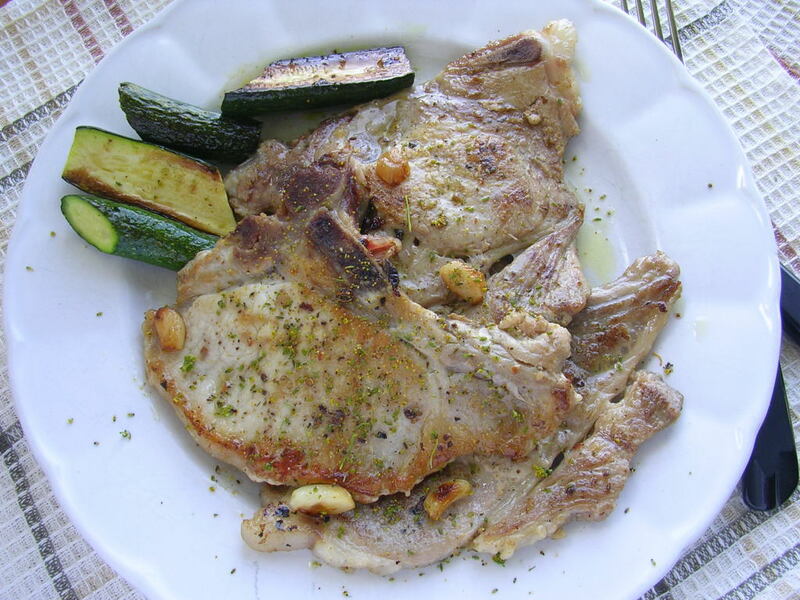 It was a simple meal for people working in the fields, in vineyards, olive plantations, citrus groves, wheat fields or cork forests. Bread soaked in water was the basis, to which was added oil, garlic and salt for flavor, plus whatever fresh vegetables were available—tomatoes, peppers and cucumbers in the summer. Tomatoes from the garden for gazpacho. Everything was pounded together in a mortar or dornillo, a large wooden bowl. 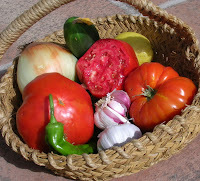 Gazpacho provided nourishment, quenched the thirst, and sustained a body working in the hot sun. From these peasant beginnings, gazpacho has become quite the cosmopolite, appearing on the menus of sophisticated restaurants in many parts of the world. I am constantly astounded to see recipes for gazpacho in American food mags that call for tomato juice, beef broth, ketchup or chile-hot salsa. Besides authenticity, something is lost in the translation—namely, the freshness of gazpacho made with raw ingredients. If there is a single essential ingredient in gazpacho it is extra virgin olive oil. (If you thought it was tomatoes, remember, there are white gazpachos too.) The oil contributes flavor and, in combination with bread, turns the cold soup into a thick, creamy emulsion. If you have tasted gazpacho at a restaurant in Spain, you may have had it served with accompanying dishes of chopped onions, peppers, cucumbers, tomatoes and croutons. Other authentic touches are sprigs of mint, chopped egg, chopped apple or melon. Flavorings for authentic gazpacho are few—salt—but no pepper—garlic, cumin, sometimes sweet paprika—but never hot chile. But, hey, if you like the idea of chopped basil, give it a try. I sometimes serve gazpacho with cucumber granita (that recipe is here). 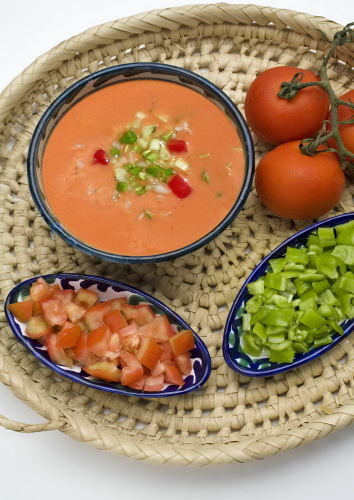 Gazpacho also is typically served in tall glasses to be sipped or in shot glasses as a tapa. Check out this video clip—I’m showing Padma Lakshmi (host of Bravo’s Top Chef) how to make gazpacho in my kitchen in Spain. The whole program, part of Planet Food—Spain that Padma hosted, first aired on the Food Network in 2001 and still gets shown on the Discovery Channel round the world. I occasionally get messages from friends in Singapore or Sydney or San Francisco saying they’ve just seen me on TV. I'm the short one, holding the bottle of olive oil. The gazpacho should be the consistency of light cream. If it is to be served for sipping, thin with additional water. Lemon juice can be substituted for the vinegar. Squeeze the water from the bread and place it in blender or food processor with the garlic. Blend until smooth. Add the tomato pulp, green pepper, cumin and salt. With the blender running, add the oil in a slow stream. Blend in the vinegar and some of the water.